With the cooler season approaching, it is the time of the year when you can enjoy the outdoors more in Dubai. It is also festival time with the Christmas and New year approaching, this is an opportunity to take advantage of the pleasant weather and arrange outdoors gathering. But before you think of doing that you need to take a good look at your outdoors areas and see whether they are clean enough to entertain guests. Traditional Middle Eastern and Asian homes typically have secluded open areas where the family can relax to enjoy the cool evenings and nights. These areas can be present as courtyards that are situated in the center of the house with the house built around it; deep verandahs that may either run along the sides of the house or can be wrapped around the house; patios that may have a roof or not and may either be dirt packed, concrete or paved with brick or stone. Other outdoor areas could include porch, deck, terrace or a balcony. All these areas are a part of the house but are mostly open to the elements. A house may have a combination of these and end up with a verandah in the front and a yard at the back. The size of these outdoors areas may vary too from a few square feet of open areas to large yards with sheds and storage areas. These area, being out in the open with little or no protection are more susceptible to getting dirty than the interiors of the house. Any outdoor area will have its own bits of furniture and fixtures as well as decorative elements. Often these areas are neglected and not used very regularly. This is especially true of the backyard which often becomes a repository of all the unwanted things in the house. Your yard is a part of your home and if you wish to have clean and tidy house, you cannot ignore the outside areas. There are other equally compelling reasons to keep the outdoor areas clean these include: 1. Keep the outside clean to keep the inside clean: Yes, that is true. Everytime you pass through these outside areas, you carry a bit of them back in with you. It may be in the form of dirt, dust or even germs. If you wish to have clean interiors, you have to clean your outdoor areas too. 2. Have a pleasant place to relax: your outdoor areas can be an extension of your interiors, this is especially true of a home with young kids who need a lot of space to expend their energy. The open to air area can become a place where you can relax with a cool drink and soak in the cool evening air or even have a meal while enjoying the pleasant evening. But you can only do so if it is clean. 3. Prevent pests and diseases: unclean and cluttered yards can become a magnet for pests and stray animals. They find shelter in the clutter and create an unhealthy environment for your family. To keep out the mice, rats, snakes, cats, dogs and various insects, regularly clean the yard. 4. Prevent accidents: without regular cleaning, your outside areas can become overgrown, dirty and an accident waiting to happen. People can trip on the stuff lying around or slip on the grime and slime that can build up if regular care is not taken. To avoid accidents, keep your yard clean. 5. 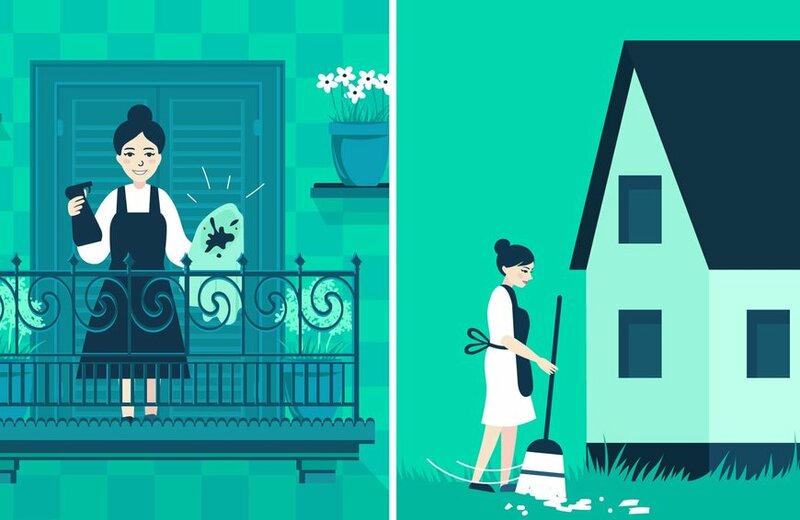 Prove that you keep a clean house: even if you hire a maid in Dubai, unless you instruct her to do so she will not clean the outdoor areas. Keeping a clean house requires eye for detail and diligence. Make sure that you keep an eye on the outdoor areas and keep them clean to avoid being called sloppy. 1. Sweep daily: make sure that all the outside areas are swept daily. This prevents the build up of dust and debris. Outdoor areas are open to elements and the winds can blow in dead leaves, sand and dust that settles on the floor. This needs to be cleaned away as a build up of this dust and debris can lead to your yard becoming unpleasant and inhabitable. Daily sweeping also ensures that any unwanted creatures who have found refuge in your yard are driven away. 2. Remove weeds: Patio floors are likely to go to weed fairly quickly without proper care. Make sure that any cracks and spaces between the paving blocks or on the patio floor are cleaned regularly. At the first sign of weed, pull it out and treat the area with a natural or organic weed killer. 3. Fill up the gaps: if there are any cracks and gaps, you need to fill them up to prevent dirt from accumulating in the cracks and encouraging growth of weeds. So fill up all the cracks with a suitable filler. The filler will vary according to the floor of the patio. 4. Wash regularly: The yard or patio can do with a good wash every so often. This helps to remove fine dust and dirt that gets embedded into the floor surface. If you have a pressure washer, use it as it can dislodge the fine dust particles that are otherwise impossible to remove. If left unattended, these particles can, over a period of time, discolor and destroy your patio floor. If you do not have a pressure washer, use warm soapy water and a hard bristle brush to clean up the floor. You will be surprised at the amount of grime you remove each time you wash. 5. Take care of the furniture: The outdoor furniture is normally made to withstand the harsh weathering it has to bear. But this does not mean that it should not be cared for. If you have plastic chairs and tables for the patio, make sure you store them away from the sun after use. Direct sunlight can discolor and render plastic brittle making your furniture more susceptible to wear. Wooden furniture should also be brought in after use or covered if you wish to leave it outside. Metal furniture can be left in its place as long as you paint and dust it regularly. All the soft furnishing such as cushions, should always be stored away after every use. If you have a covered verandah or a balcony, then the furniture can be left outside as long as it is protected from direct sunlight during the high heat summer days. 6. Deal with algae, moss and lichen on the patio: if there are any green patches of algae, moss or lichen, these should be cleaned as soon as possible. Anyplace that is not in direct sunlight or is moist will have some algae or moss growth on it. The best way to deal with it is to use bleach on the green areas. The bleach kills off the algae or moss. If left unattended, the patches can spread, become slippery and cause accidents. 7. Take care of umbrellas and awnings: If you have any umbrellas and awnings in your patio, they need to be cleaned periodically. Fold them up when not in use to make them last longer. Keeping the outside areas can be a lot of work for a working expatwoman. You can always hire a maid service in Dubai to help you out with the extra work. 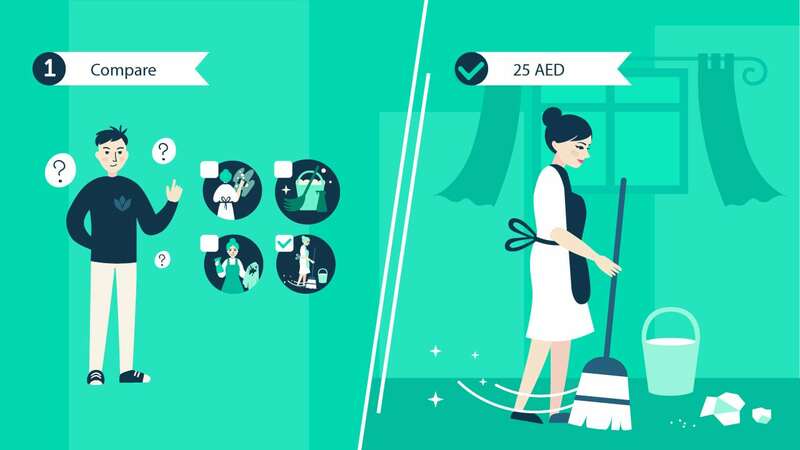 If you are looking for domestic help, do check in the maid services listed at help4u.today, which is a listing website for the most reliable domestic service providers in Dubai. 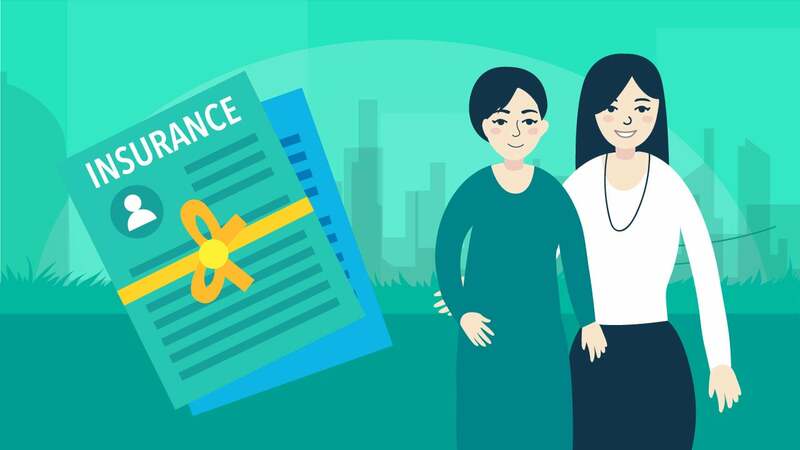 Whether you are looking for a maid or a babysitter in Dubai or even a gardener or a pet walker, you are sure to find someone within your budget on help4u.today. 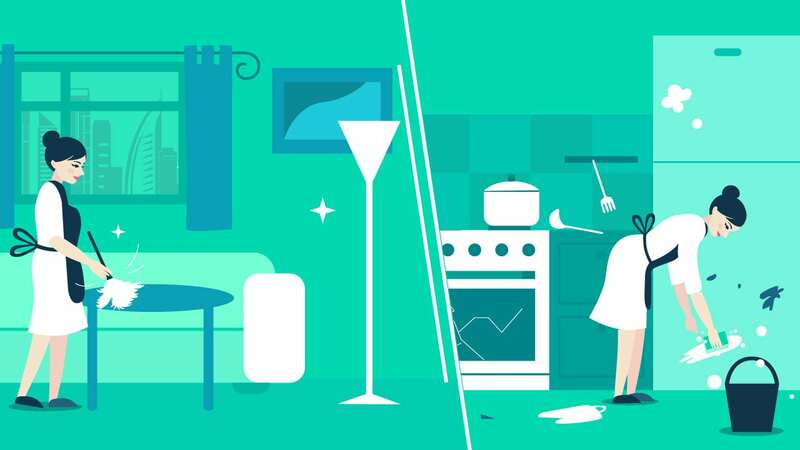 Login to help4u.today now and set yourself free from domestic chores. Once you have a clean and tidy patio or verandah, you can easily make it more attractive with potted plants, decorative items, hanging lanterns and light and you are ready to entertain guests in style on your patio.